We were heading to Epcot today to dine at the Mexico pavilion’s La Hacienda (thanks to our friends Kelly and June! ), and we’d been told that Gaston (from Beauty and the Beast) and Wendy Darling (from Peter Pan) were greeting guests. 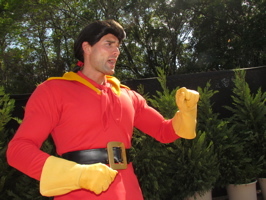 Both Gaston (below, left) and Wendy were testing, likely for meet-and-greets in the new Fantasyland. Gaston was quite the hit with the women, as one grabs a load of his muscular arm (below, right). The third Star Wars Weekend was a tremendous amount of fun! 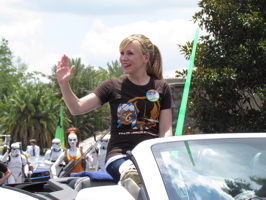 We secured a terrific location again for the motorcade that is led by Jedi Mickey (below, left) and includes Clone Wars actress Ashley Eckstein (below, right). Ashley is the host of the Clone Wars seminar during all 4 weekends. 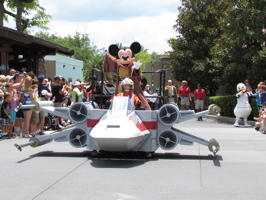 We made it to Star Wars Weekends early enough last week to enjoy the motorcade that is led by Jedi Mickey (below, left). 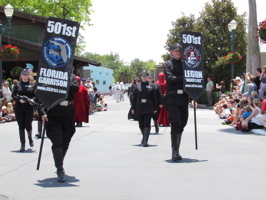 The 501st Florida Garrison and 501st Rebel Legion are always on hand to lend the parade authenticity (below, right). 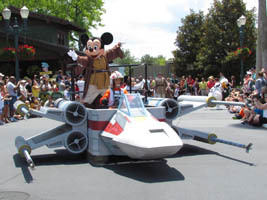 We arrived at Disney’s Hollywood Studios on Sunday afternoon to enjoy Star Wars Weekends. It was our second visit this weekend, the first was Friday when George Lucas made an appearance to dedicate the newly re-opened Star Tours attraction (below, left). 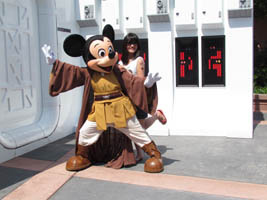 Jedi Mickey (below, right) is one of many characters that pose with guests during this popular event! 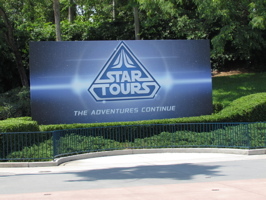 We had a terrific time at the Star Tours Meet-Up, which was at midnight on Thursday, May 20th – the grand opening day of “Star Tours – The Adventure Continues“. We’d already ridden this updated attraction twice in the previous week during soft openings. Parking was at Blizzard Beach, and we arrived at 10:45 to check in. 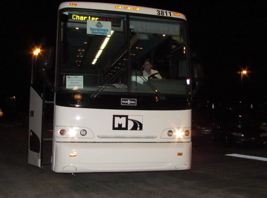 We waited on the bus (below, left) for about 45 minutes until it was time to be taken to Disney’s Hollywood Studios. 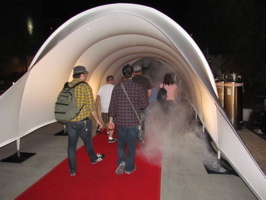 The red carpet and smoke (below, right) from an event earlier in the evening was still out for us. 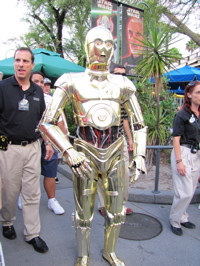 Star Wars Weekends was another hit this week, and C-3PO has been the biggest draw of all! (below, left and right). Crowds have followed him anytime he’s left his meet-and-greet spot, and lines have been long today to meet him. 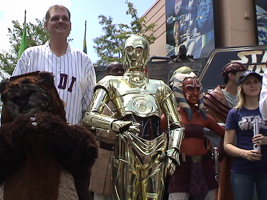 He was in the Celebrity Welcome as well (below, left), standing next to Tom Kane. 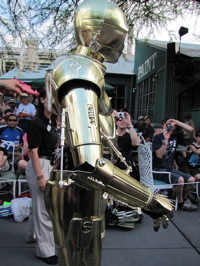 We were very surprised yesterday at Star Wars Weekends to see an interactive talking C3PO in the park! 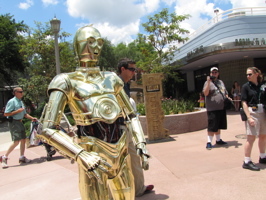 While waiting for the Hyperspace Hoopla, we heard the crowd get a little louder – we turned around, and C3PO was walking by (below left and right). 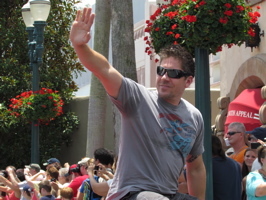 He is fully interactive, in the way that the Mickey Mouse was in a test at Disneyland.